The Corporations Online Filing System utilizes a new technology that enables users to fill in the form directly on the screen. The form is then submitted electronically to the Secretary of State's office for final processing. Payment: MasterCard, Visa, Discover, American Express or monthly billing to an INA account. Official Dating Policy: Filings submitted online by 3:00 p.m. CST will be recorded as of date submitted. Filings submitted after 3:00 p.m. CST will be recorded on the next business day. 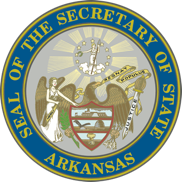 • Notice per Act 1008 of 2007- A corporate filing with the Arkansas Secretary of State does not necessarily give you the right to use your proposed corporate name, corporate name, assumed or fictitious name in this state if the use violates someone else's trade name, trademark, or service mark rights under the trademark laws of the United States, this state, or the common law. Prior to your use of the name, you are encouraged to research the names and marks of other parties used or registered in this state, or registered in the United States Patent and Trademark Office, or consult an attorney to determine the existence of any conflicting rights. • Processing of incorporations is subject to availability of corporation name requested. Filings are not final until satisfactory completion of statutory requirements is verified by the Secretary of State's office. A file-marked copy of a successful filing will be returned to the filer by mail. • Concerns regarding filings submitted online will be addressed via telephone call to the filer. • Instructions may be found on the top of some forms, however, most forms are self-explanatory. • All domestic for-profit corporations are subject to Arkansas Corporate Franchise Taxes. Tax payments are due in the office of the Secretary of State each year by May 1st for corporations in existence during the prior year. If you have not received a Franchise Tax Report by March 20th, please contact us via e-mail at corporations@sos.arkansas.gov or by telephone at 501-682-3409 or toll free at 888-233-0325.
may view their transaction history here.